NIA CHARLESTOWN NEVIS (November 18, 2014) –A team of consultants from the United Nations Educational Scientific and Cultural Organization (UNESCO) Headquarters in Paris, accompanied by Secretary General of the National Commission for UNESCO in St. Kitts and Nevis Antonio Maynard met with Deputy Premier of Nevis Hon. Mark Brantley to discuss the formation of an Education Sector Policy Review and an Education Sector Strategy Document in St. Kitts and Nevis. The meeting was held in the Cabinet room of the Nevis Island Administration (NIA) on November 19, 2014. 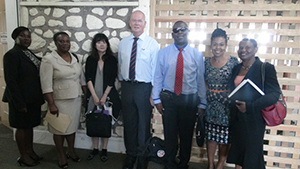 Also present were education officials from Nevis. Education Planner in the Department of Education on Nevis Dr. Neva Pemberton told the Department of Information that discussion went well. “The consultants are here over the course of the week to meet with stakeholders to discuss four areas that are going to be included in the policy review. We are looking at governance, which includes management, planning and monitoring evaluation. We are looking at the teaching and learning environment, curriculum as well as academic staff policies. “The meeting went very well. We spoke about the issues that we are going to be discussing with stakeholders throughout the course of the week and the Deputy Premier offered his support throughout the process,” she said. According to Dr. Pemberton, the team of consultants would assist with the formation of the Policy Review and the Strategy Document. She explained that Education Officials in the Federation were taking that route in an effort to deliver a more effective education system for greater success among learners in St. Kitts and Nevis. “Within the sub region we have an Education Sector Strategy with a vision of every learner succeeding and so what we are doing in St. Kitts and Nevis, is to develop a Sector Strategy that aligns with that regional strategy. We have a lot of work to do to improve the quality of our education systems, such that, students leave with the life and work skills that they need. Which means we have to review the standards that we have in place, review things like our assessment mechanisms, to ensure that more students have current access to success. 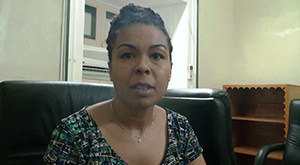 “As we know it, we have the [Caribbean Examinations Council] CXC [Caribbean Secondary Education Certificate] CSEC exams but not all of our students are able to take and pass that exam and demonstrate success in that avenue and so, we have a large number of students who leave school without current standards of success and really, it’s our job as educators, to ensure that more of our students and ideally, all of our students, leave secondary school with a measure of success,” she said. Dr. Pemberton further noted that through the strategic planning and policy review processes they planned to look into the various policy options that could be pursued to better serve more of the students. The Policy Review Process is expected to be complete by February of 2015 and by May that same year it is expected that a Sector Strategy to guide education development and policy for the next five years would be completed.